July was a good month to finish books. Ready Player One (RPO) by Earnest Cline takes place in 2044, but it’s filled with references to the 1980s. Most of this story takes place within a massive multiplayer online role-playing game called OASIS. The story begins with the death of the creator of OASIS who offers to bequeath a fortune to the player that can solve a quest within OASIS. To task requires considerable knowledge of 1980s trivia. This sci-fi book in the future is filled with references to PacMan, War Games, Monty Python, Rush, numerous television shows, and more. The story blurs the virtual with physical worlds. Power and wealth are at stake, and people do die. RPO is a well crafted story. While RPO is an intense ride, it is not particularly futuristic. There are some impressive gadgets, but relies mostly on existing technology. For a darker ride into near-future tech, check out Daemon by Daniel Suarez . It blurs the virtual and physical worlds with AR and game characters come to life. RPO was recommended to me by Tsahi Levi-Levent. 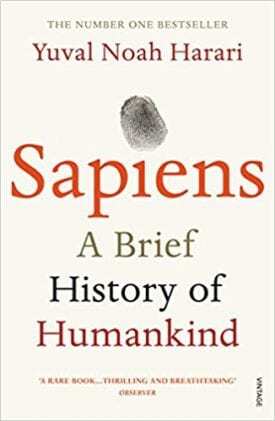 Sapiens by Yuval Noah Harari is a profound book. I was expecting it to be about biology or evolution. Kind of like Undeniable (which I really liked). Maybe the first chapter was like that, but Sapiens is really about how humans are so different than every other animal on the planet. A big difference is our ability to create and participate in shared fiction. Our modern society works because we participate, promote, and believe in shared fictions such as nation states, money, religion, and more. You can never convince a monkey to trade his banana for a reward in the after-life – that’s our thing. Another big one is our ability to communicate, but that’s relatively minor to fiction. I never really thought about how much of our world is based on these shared fictions, or how much these fictions impact science. We are indeed a very unusual species. The subtitle, a brief history of humankind, is accurate. Harari covers a lot of ground in this book from crawling out of the swamp, landing on the moon, and even modern healthcare. It’s a fascinating book that left me wondering if we will continue to master our planet or destroy it. I highly recommend this thought-provoking book. Sound simple? It’s not. How humans will interact with robots is going to get very complicated. Sure, the book was a work of fiction, but the issues are real, and told beautifully in short story form. For example, in one story a child forms a tight bond with her nanny-bot. Is that wrong? What if the child prefers the bot to human friends? We are already seeing today kids that prefer their smartphones or tablets over human interaction. Reminded me a bit of A Measure of a Man, a Trek TNG episode that in a trial, debates if Data has the rights of a person. When do ‘intelligent’ bots get personal (vs. property) rights? As AI allows us to use robots for more and more functions, it’s going ethics and logic are going to get very complex. Several of the stories are very short. Try a few. Adultery by Paulo Coelho. I found this book in the staff picks section of the Last Bookstore in Los Angeles — and I had to know more. This is a first person account of an attempt to make life more interesting. The main character is a bored woman in Geneva that has it pretty good. She lives well, happily married, healthy children, has a decent career – things are so good that she’s bored. She has an uncanny ability to rationalize anything. A minor point of humor comes from everyone around her failing to validate her thinking (“perhaps you should see a marriage counselor”). The book was originally written in Portuguese, but is well translated. I enjoyed the tale — certainly more than she did. It reminded me a bit of The Remains of the Day by Kazuo Ishiguro in the way that both books accidentally tell a story through inner monologue. I (attempt to) post monthly book reviews.